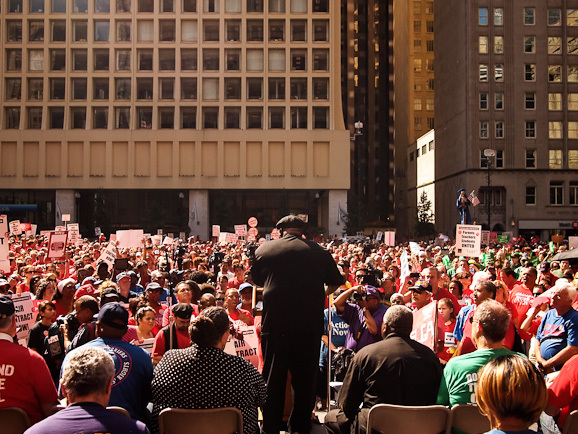 On Labor Day, thousands of teachers–joined by other union members, parents, and students–poured into Chicago’s Daley Plaza to rally and march “Jobs, Dignity and a Fair Contract” just one week before a strike date authorized by unanimous vote of the Chicago Teachers Union delegates. 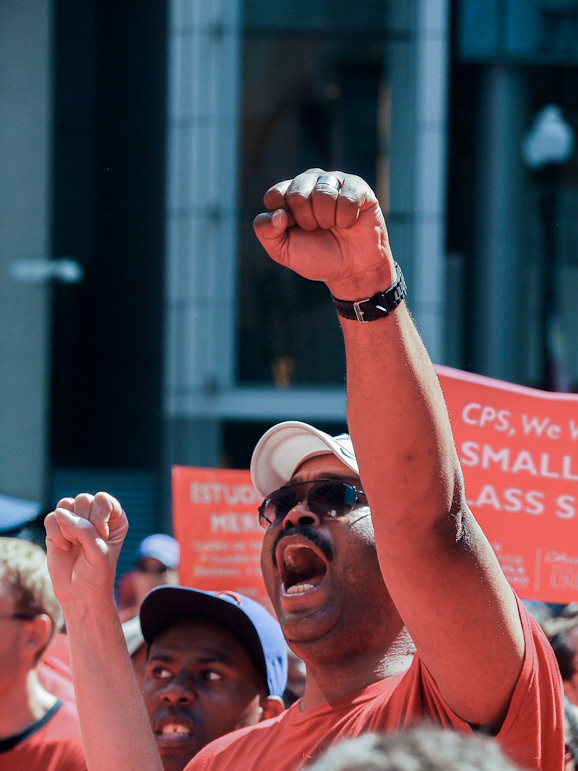 If the 26,000 members of the CTU strike, it will be an event of national significance and potentially one of the most important labor struggles in a generation. 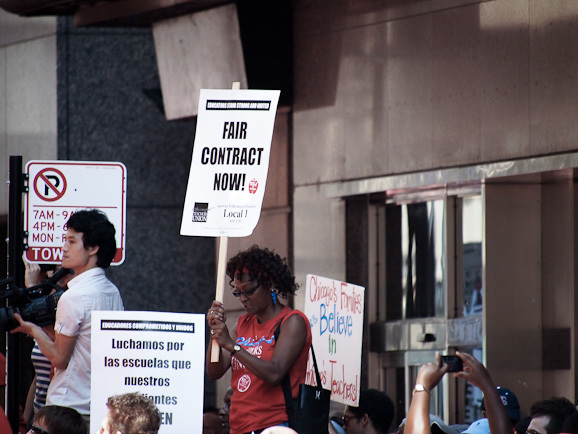 Not only will its conclusion impact the capitalist offensive against public services and their unionized workforce, but has the potential to shake up the politics and strategy of the labor movement–which, with few exceptions, has focused (often unsuccessfully) on defending the narrow economic interests of its own members, suffered due to a lack of democracy and member initiative, or both. 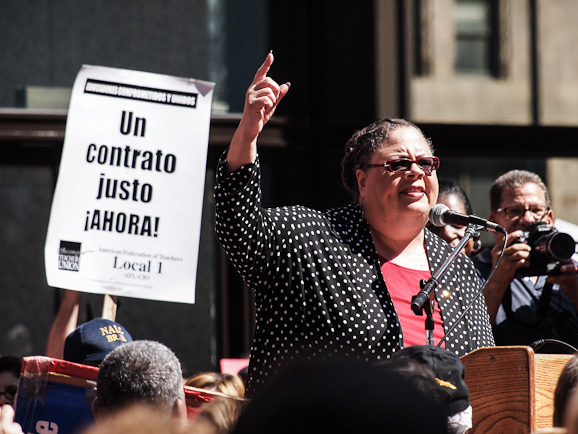 CTU’s current leadership emerged from the CORE caucus, itself the product of grassroots struggles by teachers and community to stop school closures in Chicago’s impoverished Black and Brown neighborhoods. In office, they have slashed salaries to focus resources on organizing the union’s membership and uniting with community organizations around a program of social justice: producing educational materials on the racial disparities in Chicago Public Schools and its workforce, exposing the policies that starve school funding while further enriching the City’s elite, and fighting the nationwide effort to destroy public education through privatization and charter schools. 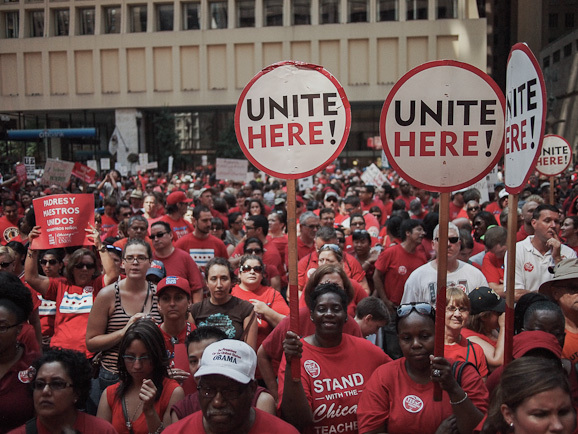 The fruit of these efforts was on full display through the unity, determination, and spirit in the sea of workers, clothed in CTU red, that issued their challenge to Chicago Public Schools CEO Jean Claude Brizard, Chicago’s 1%, and its mayor, Rahm Emanuel. 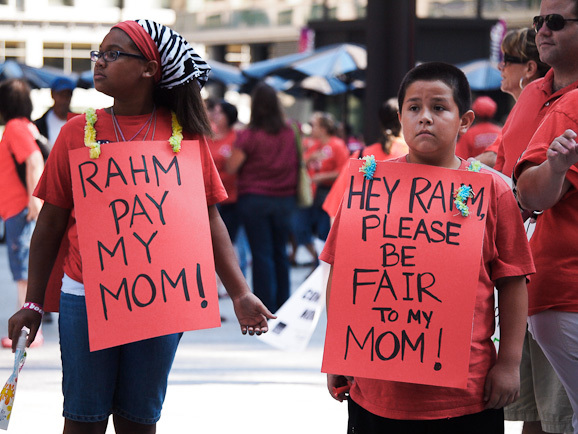 Children of CTU members joined the rally to support their parents’ contract fight. City officials, media, and front organizations for school privatization like the Gates Foundation’s Stand for Children have predictably tried to blackmail the teachers by treating their strike vote as a threat to children. Needless to say, those voices are silent when it comes to the impact of school closures, firing of beloved teachers, and severe lack of resources in many schools. One participant made a dramatic statement about the threats to public education, and perhaps about the grim future of students graduating into a world of structural unemployment, as well. Jitu Brown, an organizer with Kenwood-Oakland Community Organization on Chicago’s South Side, addressed the crowd: “This isn’t just about a contract, but about what kind of city we want to live in!” KOCO and other organizations have alled with the CTU in their long fights for equal educational opportunities. 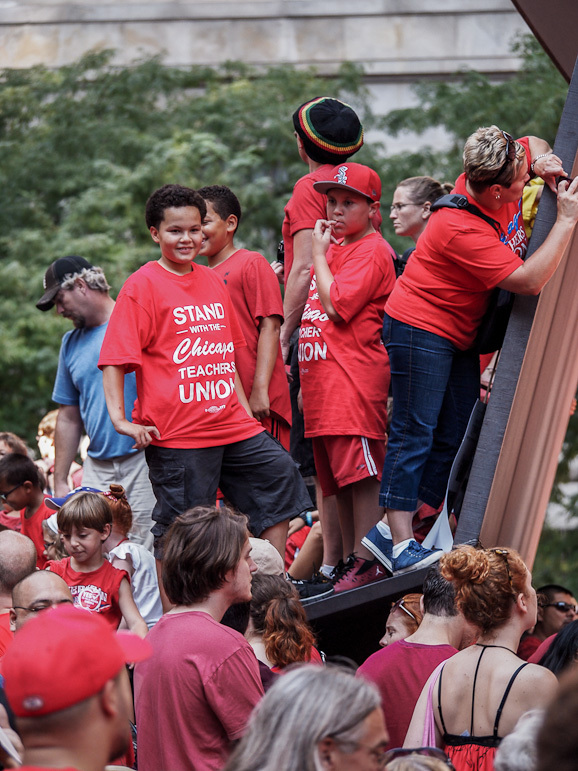 Demonstrators climbed the iconic Picasso sculpture in Daley Plaza for a better look–some of them wearing the newly iconic “Stand with the Chicago Teachers Union” t-shirts printed by the Chicago Teachers Solidarity Campaign. 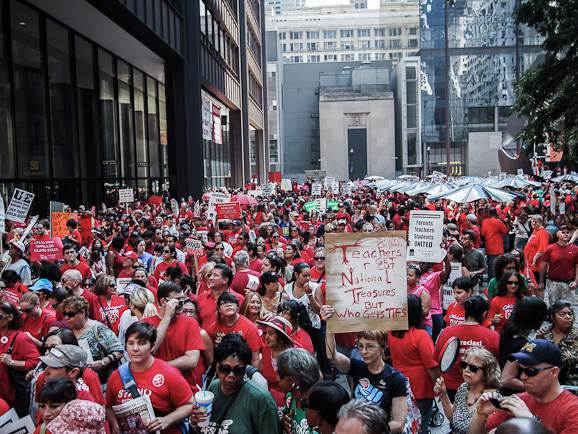 For many teachers, the decision to strike was as much about defending their self-respect and dignity after countless humiliations by education “reform” bureaucrats in Chicago, not to mention the seemingly endless scapegoating of teachers for deep social problems. 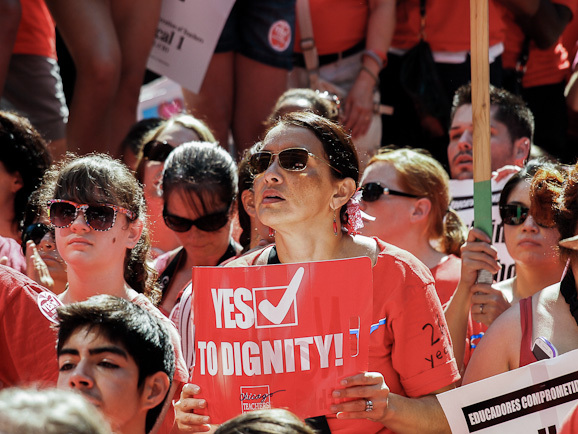 Over three-quarters of Chicago’s teachers are women, posing a challenge to the persistant masculine image and male leadership of the US labor movement. 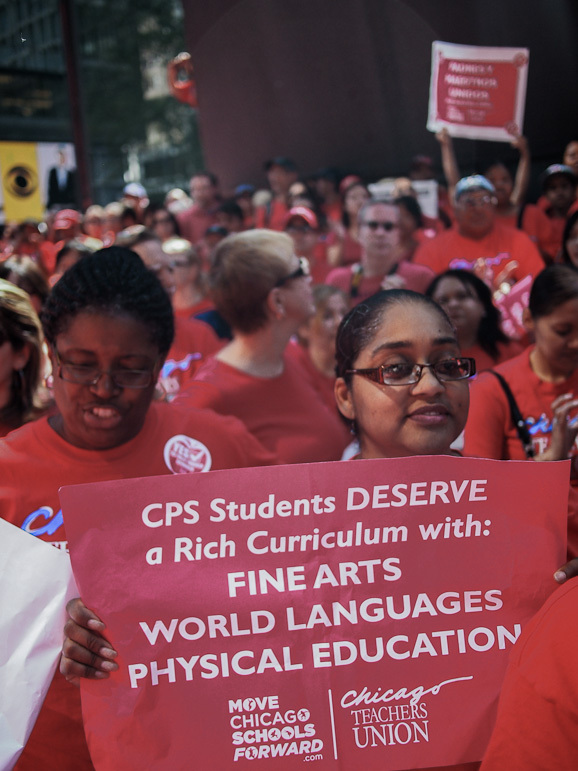 While Rahm Emanuel has tried to ram through a longer school day as a backdoor attempt to cut teacher pay, CTU has countered with emphasizing a “better” school day which exposes children to the kind of rich material (like world languages, athletics and fine arts) that would make them lifelong learners. Energy was high throughout the rally. 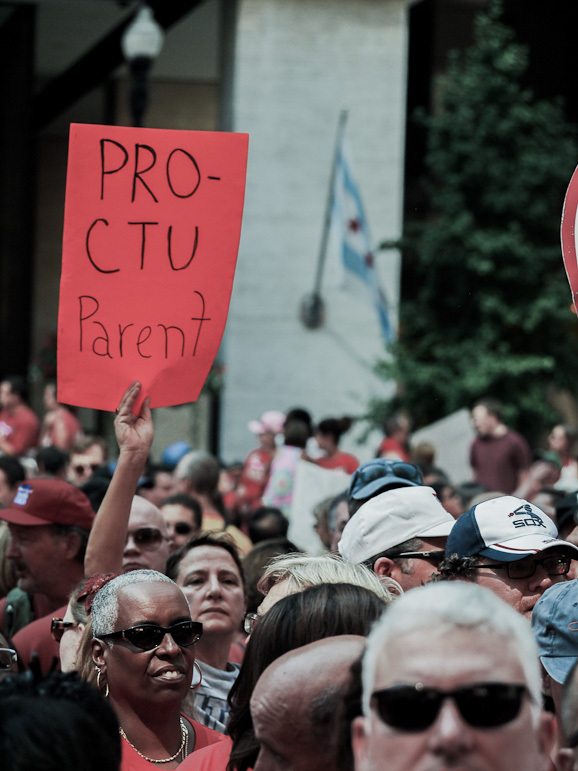 Parent supporters of CTU have organized themselves in multiple organizations across the city, on the community level as well as a citywide network called Parents for Teachers which works to counter efforts of dividing the two groups. 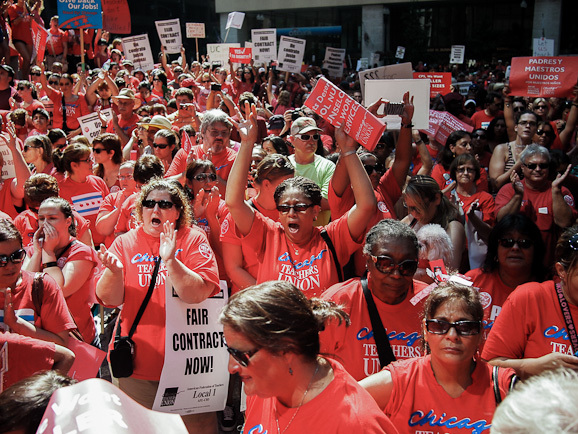 Cafeteria workers in CPS belong to UNITE HERE Local 1. Pressured by the city to bargain in advance of the teachers, Local 1 signed a contract that obligates its members to report to work in the event of a teachers strike, part of a strike-breaking strategy of keeping over 100 schools open as little more than day care centers during the strike. 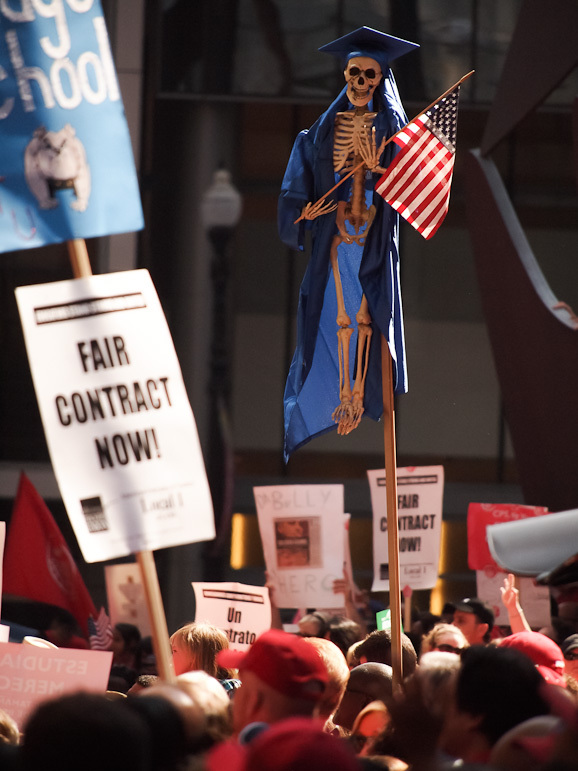 The rally packed Daley Plaza with contingents of workers from many public and private sector unions as well as supporters from outside the traditional labor movement. 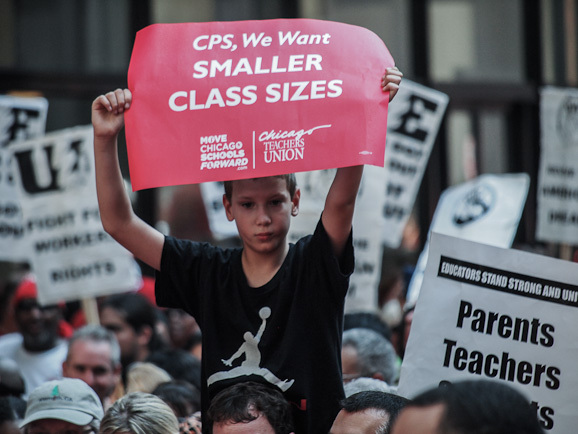 A child holds a CTU sign demanding smaller class sizes. In some elementary schools, the number of students per teacher is as high as 40. 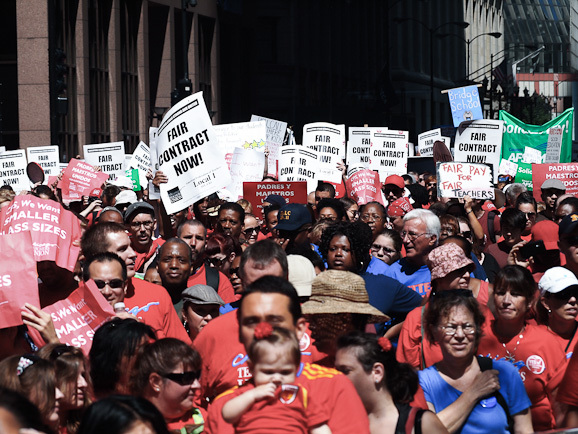 In the 1990s, Illinois state legislature passed a law that prohibits bargaining over issues liks class size unless they are first introduced by the city–an attempt to isolate the teachers by forcing them to appear concerned only about their own salaries. 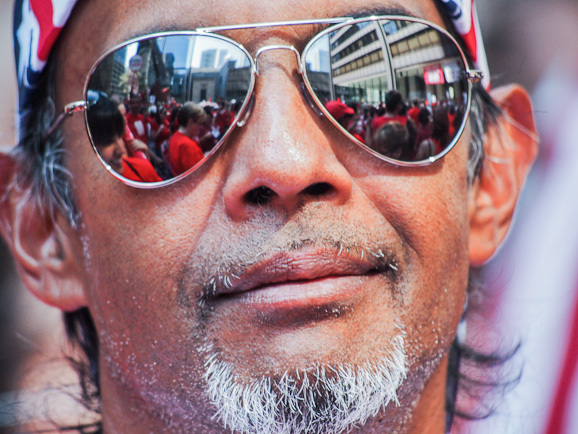 Following the rally, workers streamed across the street from the plaza to surround City Hall, in a symbolic show of force that was reminiscent of mass demonstrations by public sector workers at the Wisconsin and Ohio state capitols in 2011. The day’s activities ended in front of CPS building at 125 S. Clark Street, the site of numerous protests against the Board of Education. Rather than having its meetings in neighborhoods at accessible times, the Board forces parents and teachers to show up at 5am or earlier and wait for hours in order to speak for just a minute or two.